The man who resurrected the Serro Scotty line of small camping trailers five years ago is at it again. 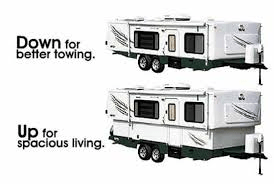 Bill Kerola announced last week he has come to an agreement to purchase the intellectual property of the defunct Hi-Lo trailer company, which ceased production in July 2010 after producing its unique telescoping travel trailers for over 50 years. The agreement includes Hi-Lo’s trademark, web site, blueprints, and goodwill of the company from the Snyder family. A preliminary time line calls for a new website to be up & running by the end of 2011 with production of prototypes to begin over the winter. It’s not known whether Hi-Lo will follow the same factory direct path that Serro Scotty has used for the past few years. I’ll post updates on this story as they develop. Howe, Indiana based Cruiser RV recently announced it’s expanding operations to a new facility in LaGrange, Indiana, which ultimately will create up to 200 additional jobs to a company currently employing 140, according to a report by kpcnews.com. Cruiser currently has the Shadow Cruiser, Fun Finder, and View Finder among their line-up. “This is a very big step for us. We’re a family-owned company and are very conservative in what we do,” said Jeff Fought, president of Cruiser RV. The company will invest more than $850,000 to lease a 140,000-square-foot LaGrange plant, add machinery for a new production line and make infrastructure improvements. The announcement by Cruiser is more validation the lightweight RV market continues to gain in popularity, as RV owners search for better fuel economy as gas prices increase. And it’s also good news for the entire Elkhart, Indiana area where the recession has hit the area hard. When Bill Kerola brought the Serro Scotty brand back to the market in 2006, he contracted with Pleasant Valley Trailers to construct the 2007 HiLander and Sportsman. All seemed to be going well between Sierra & Serro Scotty until early 2011 when Sierra decided to get out of the travel trailer building business and stick with their bread & butter: horse trailer conversions. This left Kerola to find a new manufacturer, and that he did in Cozy Travler from Goshen, Indiana. With the change in manufacturers, Serro Scotty also has faced a streamlining in their lineup. Gone are the Silver Series trailers and the Pup. The Sportsman is facing an overhaul in its design, and a new entry level model, the Scotty Lite, was introduced to the public in July 2011 at the Crossroads of America Tearjerkers Rally in Indiana. The Scotty Lite is built by teardrop trailer manufacturer Trekker Trailers in Central Florida. It boasts a weight of less than 1,000 lbs, meaning it can be towed by many small cars. With its rather spartan amenities, its only options are air conditioning and electric brakes. One decked out will fetch a price of around $9300. The HiLander (built by Cozy Traveler if you’re keeping score), remains essentially the same, with the exception of a few minor cosmetic changes, both in the interior and exterior. And good news for the consumer, they were able to hold the price for the 2012 models as the 2011 models. As for the Scotty Sportsman, the Serro Scotty website tells us the new model will be coming out sometime in 2012. So as of now, the only new models being produced are the HiLander and the Lite. The redesigned Sportsman will fit somewhere in between the two in size. And when it comes out, we’ll let you know! 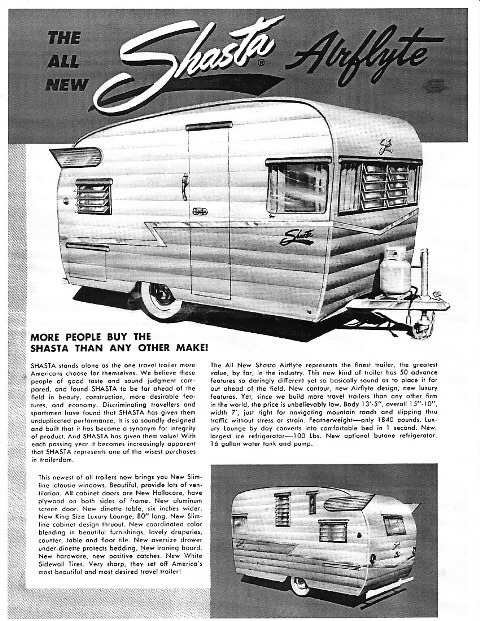 Shasta has been synonymous with small, lightweight travel trailers since the 1950’s. With their classic rear wings and distinctive paint designs, Shasta was the top selling small trailer throughout the 50’s & 60’s. Fast-forward to 2009. Parent company of Shasta, Coachmen, reintroduced a retro designed Shasta Airflyte 12. At 17′ from hitch to tail, the 2009 Airflyte offered a sleek interior with a flash of European flair. 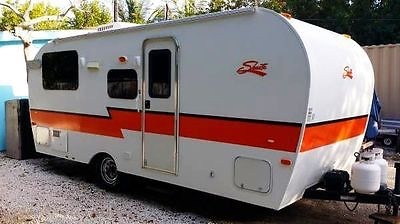 However, the 2009 Shasta Airflyte would be short lived. With just over 100 produced, the plug was pulled on the Airflyte. Sales likely weren’t construed as “brisk”. One big reason was the Airflyte was all electric, no propane. That’s fine if you’re at a campground where there’s always electricity. But it would eliminate the possibility of camping off the grid, or boondocking as it’s often called. 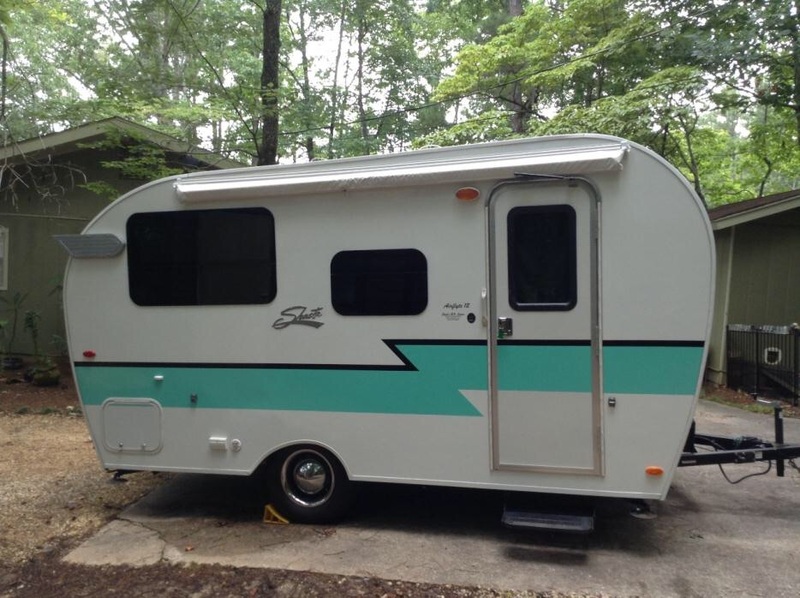 However, the other big reason of its demise is that Coachmen had been absorbed by Forest River, who already had a lightweight, retro-styled trailer in the r-Pod. “We have the only 2 produced for the 2012 models. They were discontnued as we know after 2009 models. When Coachmen looked in the plant here this summer they realized they had enough product left to build TWO units only and they would be the last 2 ever produced!! We sold 40 of the 2009s and has the oldest Coachmen dealer in the nation we were offered the 2 models. So there you have it. Possibly the last two new Shasta Airflytes that you’ll ever see.